This is Gus&apos; story about how he beat cancer. First I would like to give a brief history of how Gus came into our lives. 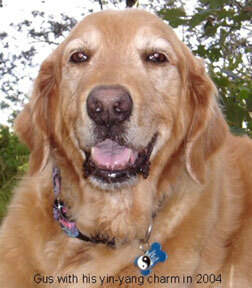 He is a rescue dog from the Long Island Golden Retriever Rescue. He was abandoned in a New York City park in the summer of 1998. After spending more than a week in the pound, he was rescued by LIGRR where he spent another month in a veterinary kennel. Gus was a young, unneutered male Golden with deep red coloring and was estimated to be 2-3 years old at the time he was found. The first time I saw him in September of 1998, I was struck by his beautiful red coat. He was being walked by a rescue volunteer and his long hair was blowing in the breeze. I fell in love with him right then and there. My husband, Mike and I were lucky enough to adopt Gus the day after we met him since we had already been cleared by the rescue to be suitable parents for a Golden. This was a very exciting time of my life. Gus was dubbed the name August because that was the month he was acquired by the rescue. They called him Gus for short and we decided to keep his rescue name. He was so sweet, always wanting to please us, got along well with our resident cats and was so, so beautiful. He was exactly what I was looking for...a perfect Golden boy. For the next few years, Gus led a happy but uneventful life spending his time hiking, swimming and just being a faithful companion to Mike and myself. In the spring of 2002, Mike noticed a small growth just above Gus&apos; left knee and this discovery changed our lives. Over the next year, we had the growth checked many times by our trusted veterinarian of 25 years. He kept reassuring us that the growth was nothing. I felt there was more to this than it appeared despite the reassurance from the vet that my fears were misguided. As time passed and the tumor grew larger, I became more and more concerned. By the spring of 2003, I could no longer be put off since the tumor had now grown to the size of a lemon. I felt there must be something wrong. My gut instinct and the love for my Golden boy led me to a point where I sought advice from another vet, Dr Chuck Timpone. He, unlike the first vet, listened to our concerns and did a fine needle aspiration, something so simple that could have easily been done earlier. To this day, I can&apos;t understand why our old trusted vet never offered this option and I truly believe that fate led me to find Dr. Timpone. The lab results from the needle aspiration were returned as mast cell tumor, Grade II. I must admit I knew very little about this type of cancer but I felt I owed it to Gus to find out as much as I could so he would get the best treatment possible. Since he was such an important part of our lives, he deserved the very best we could give him. The first hurdle was an immediate surgery so Dr. Timpone could remove Gus&apos; large tumor. I was able to convince Dr. Timpone in allowing us to bring Gus home the same day of the surgery because I felt it was so important for him to be in his familiar surroundings overnight. Don&apos;t forget, he was an abandoned dog and he has a problem with our leaving him alone. Gus was a real trooper about the surgery...very stoic with hardly any complaints even though I knew he had to be hurting from the size of the incision which went from his knee to his upper thigh. In the next few days, as Gus recuperated from the surgery, the second set of lab results came back. The margins of the surgery were not clean and had traces of MCT. This meant Gus had to have a second surgery performed only one week after the first. I was so distraught since I knew I had to put my sweet boy through the same ordeal all over again. It was so much harder for me to bring Gus into Dr. Timpone&apos;s veterinary hospital for his second surgery but I knew it had to be done. I tried to explain to Gus as best I could that I was doing this out of love and to please understand. As you might expect from a Golden, Gus was equally stoic for the second surgery and again came home the same night with an even larger incision than the first time. It was heartbreaking for me to see my boy this way but he laid quietly on his bed and enjoyed having me cradle his head and gently rub his body to comfort him. Waiting for the new lab results seemed like a lifetime but when the results came back as a clean margin, Mike and I were so very relieved. 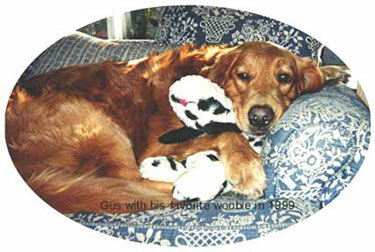 During this time Gus made what I felt was a very fast recuperation from the surgeries. Now it became time to work on a follow-up treatment plan to the surgeries. 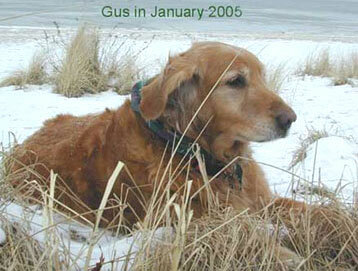 I began researching all our options for a good, safe and reliable follow-up treatment for Gus. I explored the possibilities of chemo-therapy, radiation, and Chinese herbal medicine. I knew of a veterinarian, not too far from me, who was a Chinese herbalist and acupuncturist, as well as being schooled in Western medicine. I had only heard good things from people about him. He had patients who traveled up to 3 hours to have their animals treated by him. I also discovered he had a couple who made a 5 hour drive from Maryland to Long Island so he could perform surgery on their dog. I felt quite fortunate to have this vet within a 30 minute drive from my house. Chinese herbal medicine also seemed like a much more gentle and reliable way to proceed as opposed to chemo-therapy and radiation. Actually, Gus&apos; pet insurance would have covered the cost of the two conventional modalities but again instinct led us to make the commitment to an expensive two year Chinese herbal program. We wanted the best treatment for our boy. Money was never an issue, we merely did what we felt was best for Gus. So began Gus&apos; special relationship with Dr. Jia Jiu Wen. Dr. Wen immediately put Gus on Chinese herbal medicine for cancer treatment...seven large capsules 2 times a day. He also made changes in Gus&apos; diet to complement the Chinese herbs. One of the major diet changes was to eliminate poultry and fish from Gus&apos; diet and replace it with lamb, venison and some beef, preferably with no additives or hormones. Also added were a lot of raw organic vegetables which I minced up using a food processor. So now, Gus hopefully was on his way to a healthier life free from cancer. During his two years of herbal treatment, the only side effect that I ever noticed was a positive one... an increase in Gus&apos; energy level in the early weeks of the program. In fact it was wonderful seeing Gus&apos; energy levels improving with this treatment and diet, and it reaffirmed my belief that we made the right decision for him. Gus cheerfully adjusted to this new treatment and he thrived. Other than giving him 14 capsules daily, there was no disruption in his daily routine. He still continued swimming in the bay, taking long hikes in the woods and playing as usual. We found administering the medicine morning and night with some yogurt made it easy. Of course Gus was very agreeable to this method of having a yogurt treat twice a day. This past March marked the end of Gus&apos; two year treatment. He still sees Dr. Wen for recheck exams. At the beginning of his Chinese herbal treatment, he was checked every 2 weeks. Dr. Wen carefully palpates over his whole body looking for anything unusual. 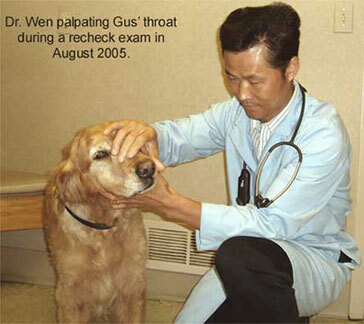 Gus&apos; rechecks have now been extended to every 8 -10 weeks. Thankfully, there has been no reoccurrence of a tumor at the site of removal or anywhere else. The Chinese herbal treatment may have cost a lot of money, but to us, Gus is worth every penny we spent. Even though Mike jokingly refers to Gus&apos; treatment costs as BMW payments, we have never had a single regret that we followed this course. Gus&apos; Golden heart and loving personality has not only enriched our lives, but enriched the lives of others as well, such as those he visits as a therapy dog. It was through Dr. Timpone&apos;s correct diagnosis and Dr Wen&apos;s herbal program plus our own &apos;dogged&apos; determination that allows us to share our lives with our beloved Gus today. Let my story inspire those of you who may have &apos;a feeling&apos; there is something more to your pet&apos;s symptoms than appears. Don&apos;t give up on your &apos;gut&apos; feelings, seek other opinions and gather as much information as you can. And don&apos;t forget to ask questions about anything and everything you don&apos;t understand. As I look into my sweet boy&apos;s soulful brown eyes and see the love reflected back at me in his kindly gaze, I know that every cent, every trip made to the vet&apos;s, every trip made to seek advice was worth every penny, not just once, but a thousand times over. After all, he is my Golden boy.